In Sweden, they design SUVs just a little differently. 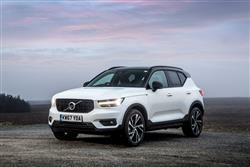 Take this one, Volvo's XC40, tested here in D4 diesel form. It gets its own 'CMA' platform and some very distinct design to set itself apart. The result is an interesting alternative to more mainstream premium-branded compact SUVs like BMW's X1 and the Mercedes GLA. And one you might rather like. A lot of Swedish rhetoric's being used in marketing this car, but actually it's culturally quite mixed. The distinctive shape is the work of young British stylist Ian Kettle and the car's built at Volvo's Ghent plant in Belgium. Under the skin meanwhile, lie underpinnings jointly developed with the brand's parent company the Geely Auto Corporation of China, who'll use this car's new 'Compact Modular Architecture' platform in a whole range of forthcoming Oriental models. There are Swedish characteristics here too of course - the ones likely buyers will probably want: class-leading standards of safety and the promise of a relaxed comfortable road going demeanour. Plus to suit the mood of the day, there's semi-autonomous driving technology and a chassis developed to take both hybrid and full-electric powertrains. We also get the option of 4WD and some really clever practical interior touches. In short, it all sounds pretty promising - which is why this Volvo received the 2018 European Car of the Year award. Time to put it to the test. 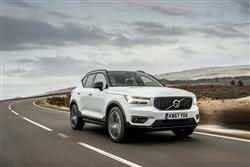 Volvo SUVs aren't generally burdened with customer expectations of super-sharp handling dynamics. But they absolutely must ride with decorum, function with refinement and be relaxing to use. 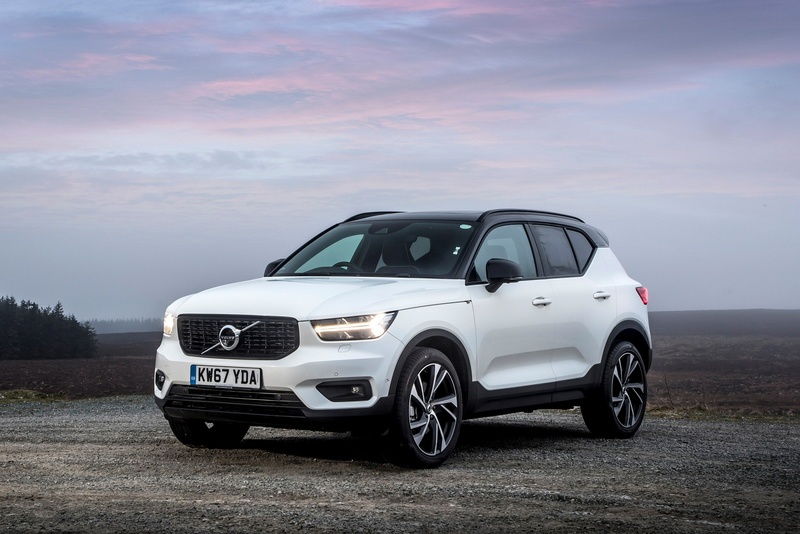 If that defines the minimum requirement here, then I'd say the XC40 slightly exceeds it, without ever really allowing any degree of driving enjoyment to get in the way of its day-to-day duties. Few segment rivals manage to be much different and offhand, I can't think of any of them that ride much better than this car over poor surfaces. Tarmac tears, expansion joints and speed humps are dispatched with the kind of confidence you might more ordinarily expect from a much larger model. All of which means that on the test drive, your first impressions will probably be quite positive. True, the steering doesn't provide much feedback, but it's nicely weighted and pleasingly direct, complementing the fact that sudden changes of direction aren't as unwelcome here as they are in some high-sided affordable SUVs. That's mainly thanks to this car's new-tech 'Compact Modular Architecture' CMA platform, a world removed from the heavy, clunky underpinnings that previous compact Volvo models have had to lug about. I tried the 190hp diesel D4 which has a 2.0-litre Drive-E diesel unit putting out 400Nm of torque which helps with a potential braked towing capacity of 2.1-tonnes. The quoted performance stats are 7.9s and 130mph. The obvious way to style this car would simply have been to merely shrink the themes established with Volvo's larger SUVs. That's usually what competitors do. But British XC40 designer Ian Kettle wanted this car to be different, which is why we've got this, a concept inspired by the small robots he used to watch in science fiction films. Curvy conformity is replaced by chunky cuteness with a 'transformer-like' vibe. Not everyone will like it - but then if everyone did, it wouldn't be such an interesting piece of design. Inside you get digital dials, a dose of Swedish minimalism and door cards made of a weird felt apparently fashioned from recycled drinks bottles. There are door bins bigger than any you'll have ever seen. 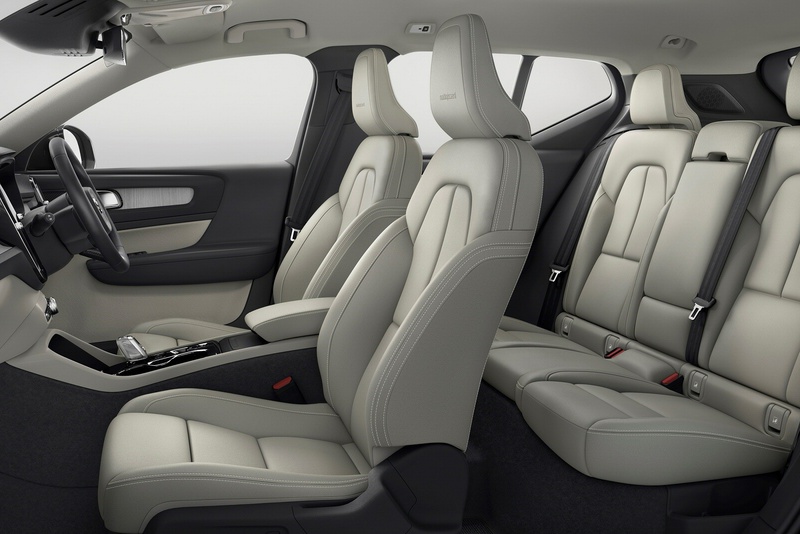 And the designers have somehow crammed in the 9-inch portrait-style Sensus infotainment screen that's used in larger Volvo models, framing it with these unusual 'Star Wars'-style vertical vents. Interested yet? In the back, headroom's generous, but we're not so keen on the way that the angled style of the rear C-pillar might create something of a claustrophobic feel for younger folk; if you've children, take them along on the test drive to make sure they'll be happy here. Lift the tailgate and you access a cargo area rated at 460-litres. I liked the optional 'Convenience Pack' which can divide the space laterally to stop your shopping from sliding around. The hinges of the provided divider even stand proud of its top edge, giving you hooks from which you can hang shopping bags. Neat. If you've looked at the various premium brand rivals targeted by this car, you'll have a pretty good idea of what to expect here when it comes to pricing. 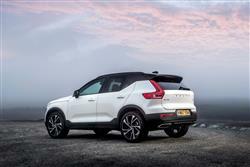 The XC40 range sits in the same £30,000 to £40,000 bracket targeted by competitors: in other words about £10,000 above similarly-sized 'Qashqai-class' family hatch-based SUVs from the volume makers. There are usually three main trim levels - 'Momentum', 'R-Design' and 'Inscription'. For this test, we opted for the 2.0-litre diesel unit - in this case in 190hp D4 guise, a variant which is only offered with AWD and an auto gearbox and is only available with the top two spec levels, hence the relatively high D4 asking prices which start from around £35,000. Our test car's sporty 'R-Design' trim incorporated gloss black styling details including a contrasting colour black roof, plus diamond-cut black alloy wheels, part-leather seats and aluminium dash inlays. Top-spec 'Inscription' variants meanwhile, enjoy fill-leather upholstery, an electric tailgate, wood detailing and a crystal glass gearlever. As ever with Volvo, a key focus is safety. An autonomous braking system is standard-fit and this system can specifically detect people and animals. There's also an 'Oncoming Lane Mitigation' set-up that not only stops you from pulling out into the path of an oncoming vehicle but can also steer you away from such an impact. 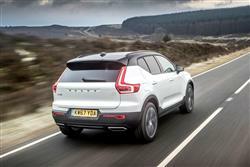 Pilot Assist, Volvo's innovative semi-autonomous drive feature, is an optional extra on every XC40, as is 'Run-off Road Protection and Mitigation'. And Cross Traffic Alert with brake support', which warn you of oncoming vehicles when you're reversing out of a space. The 190bhp D4 variant we tried manages combined fuel consumption of up to 56.5mpg and CO2 emissions from 133g/km. German rivals improve on that - but not by very much. For reference, in manual 2WD form, a 150hp D3 version of this car can manage up to 58.9mpg and 127g/km of CO2. Of course, ultimate running figures aren't just about fuel figures and CO2 stats. Residual value returns are a major contributor to whole life costs and it's important to note that the XC40 fares extremely well in this regard. Residual value experts Cap Hpi reckon that after three years or 60,000 miles, a typical XC40 model would still be worth 43% of its original purchase price. Insurance groupings should be reasonably competitive by class standards. To give you an idea, a high specified D4 diesel variant like the one we tried attracts a group 30E rating. Maintenance should also be relatively affordable for a car of this kind, with intervals every year or 18,000 miles. Three or five year pre-paid servicing packages are available to help you budget ahead. With the useful 'Volvo On Call App' remote connectivity system, this XC40 can be programmed to autonomously realise when a service is due, then automatically book it for you at a dealership of your choice. Finally, we'll tell you that the warranty is the usual three year, 60,000 mile package. 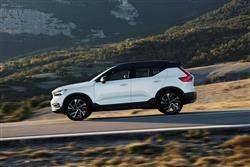 If you�re looking for a new Volvo Xc40 2.0 D3 Momentum 5dr AWD Geartronic Diesel Estate for sale, you�ve come to the right place. At Bristol Street Motors we don�t just have the best Volvo Xc40 2.0 D3 Momentum 5dr AWD Geartronic Diesel Estate deals, we also offer friendly advice and help with all your enquiries to ensure your buying experience is a happy experience.